TOM CRADDOCK delivered his thanks to Paul Cook – but admitted a judgement call prompted him to end his Pompey trial. The striker had spent more than two weeks training with the Blues following an invitation to return by Cook. It wasn’t an easy decision, considering the position I have been in I don’t really look past the next day, the next match or the next training session, and Cambridge were able to offer me more minutes on Saturday – so I took that opportunity. It was a second chance for the 28-year-old, who has battled back from a career-threatening knee problem during an injury-blighted two years at Fratton Park. Yet on Friday he opted to instead turn out for Cambridge United in their weekend fixture at St Neots Town. The subsequent result yielded a 7-2 win for the U’s – and four goals from half-time substitute Craddock. He will now pursue a deal with the Blues’ League Two rivals. And he has nothing but praise for those who offered a helping hand in his time of need. He told The News: ‘When the manager came in he invited me to train and I snapped his hand off. ‘I knew there was no commitment either way. There was a chance to come in and impress and if I did impress I could potentially earn a deal. ‘Obviously I was aware there were going to be lots of players arriving but I fancied my chances, I wanted to come back and try to prove myself after the last two years. ‘I had to make the judgement call on Friday to go to Cambridge but I am extremely grateful to the manager and his staff and wish Pompey all the best. ‘They have been brilliant to me this summer. I really appreciate it but Cambridge were able to offer me more game minutes. ‘I have done every session since we’ve been back, I was chomping at the bit to play and had to make a judgement call. 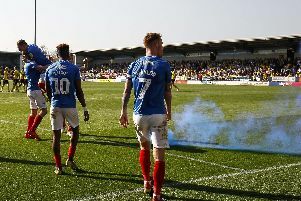 ‘At Pompey there was a possibility of playing a small part in the Havant game or training on the morning. ‘But on the Friday I was told by my agent I could get 45 minutes for Cambridge. ‘It wasn’t an easy decision, considering the position I have been in I don’t really look past the next day, the next match or the next training session but Cambridge were able to offer me more minutes on Saturday – so I took that opportunity. St Neots play in the Evo-Stik League Southern but it was a maiden first-team game for Craddock since November 2013. Now the striker, who made 11 Pompey appearances, is for the time being reunited with his ex-Luton boss Richard Money. He added: ‘It wasn’t a 7-2 game, St Neots were better than the scoreline suggests – but goals are goals. ‘I cannot get carried away, it’s pre-season, it’s 45 minutes, it’s not a league game but it is good to get the minutes in. ‘I have a game for Cambridge tonight against Lowestoft and then Norwich visit on Friday night. ‘I can get some more minutes there, work hard and hopefully earn a contract. ‘I have to prove my fitness wherever I go, whether it be Pompey or Cambridge.